WHAT?? Hurry over to Amazon where you can find this very highly rated Blendtec Total Blender Classic with FourSide Jar in Black for just $179.95 shipped (regularly $364). That is an amazing discount on a great blender!! This super versatile blender features a FourSide Jar and a ‘wing-tipped’ blade that create perfectly smooth soups, smoothies, nut butters, sorbets, fresh baby food and so much more and it features one-touch preprogrammed settings to ensure that recipes turn out perfectly every time! 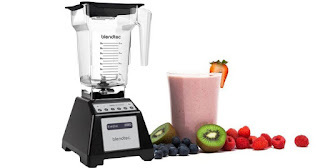 This blender can also replace many standard kitchen appliances like juicers, bread makers, mixers, and coffee grinders!